Within the 3 overall STEPS there are '7 Ways' or modalities we work with - all in a priority order, individually led by you, honouring your own life-force flow 'back to the Essence...' of your own free spirit. So, after reading or printing off the PDFs about Step 1, 2 & 3 of the 3 Step - 7 Ways *free your spirit* process, follow the links on the LEFT < < to understand those '7 Ways' you can help to balance your life. 3 Step prices for individual 1-1 sessions. Pay for all 3 Steps on the first session and I will happily reduce the total amount by £10. This does not include cost of remedies or tools that may be of support. It will be your choice whether you want to add any remedies, crystals etc that are recommended in a session or work shop. (client) hired Louise Ann Woodcock as a natural health / complementary therapist in 2011 and hired her more than once. “I brought my daughter to do some transformational kinesiology work with Louise. She was sensitive, insightful, expert and used a variety of intriguing techniques to help my daughter. She also educated her into some techniques that will stay with her for life, in an approachable and understandable way. is you don't have to understand how it works. That's our job. Come along for a personal 1-1 or to the 3 day workshops and just follow the simple instructions. Let Mother Earth, Father Sky and the Life-Force Spirit, that links us all together just flow into and through you . Let your Life-Process unfold completely. you will be well on your way to honouring your Life Purpose. 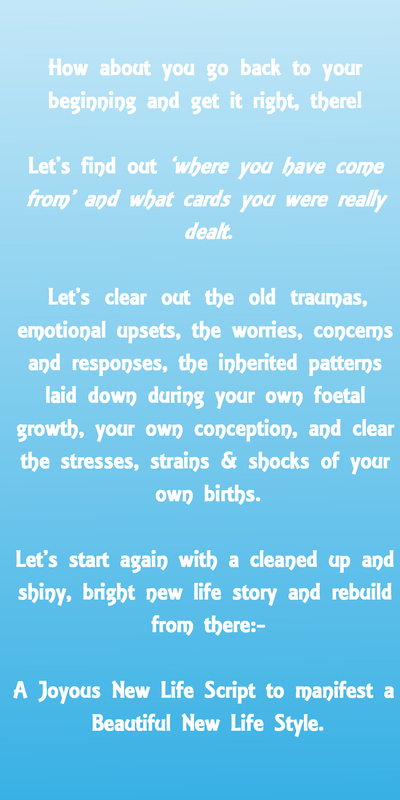 You can continuing working with us or find your own tools and practices to help Manifest the Intended YOU!